The Friends of the Jamaica Plain Branch of the Boston Public Library in partnership with Uforge are pleased to announce a new exhibition held in the renovated library space. After soliciting proposals from over 50 local artists and groups, a selection committee comprised of community members and BPL staff chose four exceptional artists to fill its gallery for the rest of 2017, with printmaker Shao Yuan Zhang exhibiting for the third spot. Born and raised in China, Zhang was sent to the countryside as a teenager, where he worked in the rice fields and created propaganda art for the communist party’s Cultural Revolution movement. In the late 1980s, he immigrated to the US to pursue his MFA at the University of Utah, developing his prowess in various printmaking techniques. Currently based in Boston, today Zhang depicts vast forest landscapes and red rock canyons with a surreal, otherworldly vision. His simplified forms accentuate a stark, isolated experience emotionally resonant with his immigrant journey. Each monotype was created with Asian rice paper using a technique derived from ancient Chinese painting. Through delicate line-work and luminous colors, he illustrates rock formations to capture how the light transforms them. With their subtle shifts in tone, quiet atmosphere, and jagged shapes, often punctuated by a solitary moon, these prints encourage close study and reflection, simultaneously suggesting faraway worlds and internal struggles. 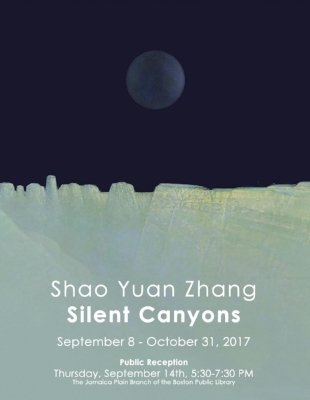 Shao Yuan Zhang: Silent Canyons is on view from September 8 through October 31, 2017, with a public reception to be held on Thursday, September 14, 5:30-7:30 PM. The library is open Monday-Wednesday 10-6, Thursday 12-8, and Friday-Saturday 9-5 (closed Sundays). The exhibition space is located on the lower level. Supporting and linking the activities of Branch Library Friends groups.